Despite recent seismic changes, the European Union is decidedly not in danger of complete collapse. However, it is unclear what the future of the EU will hold for its member states. The state of collective uncertainty has raised questions among citizens and experts alike. Yogi Berra famously said “The future ain’t what it used to be”. Plans to build a collective of 30 countries with just one border and one currency, without internal trade tariffs and in which everyone is employed, mobile and happy are no longer feasible. Recent developments changed visions of the EU’s future dramatically. The fact of the matter is no one could possibly be 100% certain of the future of the EU, as it is currently quite fluid. There are, however, reliable experts with well-informed insights on the macro trends that are shaping the Union as it moves forward. As we all know, the dramatic upset in the European Union’s structure is Brexit, the United Kingdom’s exit from several -but not all -of the EU’s agreements. The UK voted on the formal exit in June 2016. It is programmed to execute at 11pm UK time on Friday 29 March 2019. According to the BBC, “The UK and EU have provisionally agreed on the three “divorce” issues: of how much the UK owes the EU, what happens to the Northern Ireland border and what happens to UK citizens living elsewhere in the EU and EU citizens living in the UK”. Britain’s exit fee will be steep: Investopedia estimates that the UK may owe the EU up to 100 billion Euros. The economic outlook is now rather bleak, to say the least. Bankers are already fleeing in droves, courted by Dublin and Frankfurt, even Paris; traditional finance is suffering, as well as up and coming Fintech companies. Shortly after the vote, Uri Friedman made a compelling case in The Atlantic that the decision process itself was badly engineered from the start. He pointed out that (a) having a one-step process to decide such an important issue is wrong; (b) Britain, being a parliamentary democracy should at least give some weight to Parliament’s opinion, and (c) that perhaps the people weren’t at all prepared to take a stance on the issue. Friedman’s claims are evident, growing numbers of British citizens and politicians alike are calling for a referendum vote. Before dissecting the potential referendum vote, it’s important to understand why British citizens voted out. Some of the reasons that led the UK to leave are leading other nations to rethink their stance on the Union as well. The graph below shows the results of a poll taken by the BBC among those who voted “yes” on Brexit. Reasoning behind the vote was somewhat divided and arguably a bit ill-informed. The given reasons are issues that could have been managed, controlled, or negotiated within the realm of the EU without an abrupt exit. 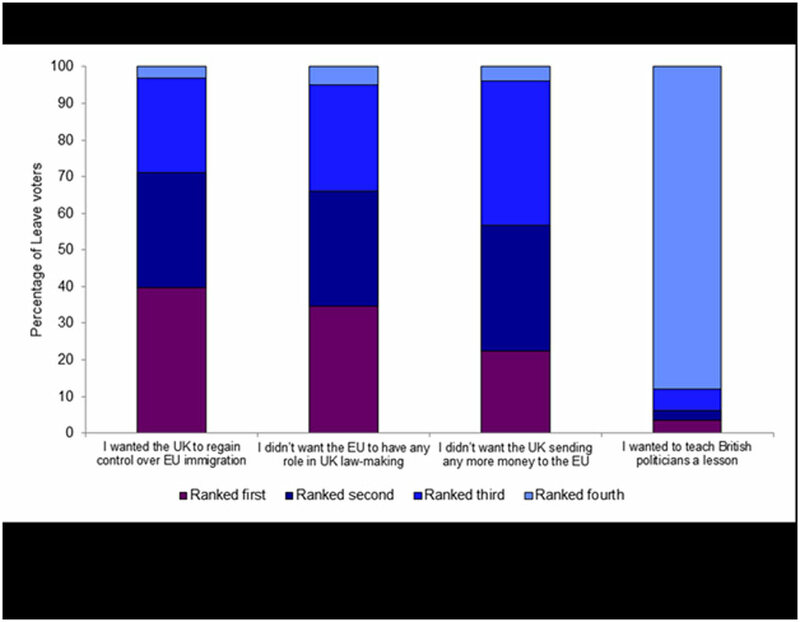 Immigration control was the most popular priority among voters and taking law-making control away from the EU took a close second. The age-old complaint that the UK contributes a disproportionate amount of financial assistance to the EU is ever present. The least popular reason was, at best, a childish attempt to send a message to politicians. None of these issues are new,all have com up occasionally in public policy debates over the years, but they’ve never been demonstrated -even collectively – to justify such a radical move. Despite the looming doubt and a degree of voter’s remorse, citizens in other parts of Europe share the concerns that led British citizens to vote “yes” on Brexit. In all but 1 of the countries listed, the majority of those polled believe that some lawmaking capabilities should be restored to individual countries’ governments, rather than the EU. Even in Poland, the proportion of the populace that believes the current division of power should remain only outnumbers those who want to seize power back from the Union by 1%. Concerns about the EU’s effect on member states are surprisingly consistent across borders,but perhaps the shock of Brexit will encourage other politicians across Europe to treat the decision of whether to remain in the Union a bit more delicately. If the issue is put to a popular vote, it should ideally be complemented by a parliamentary vote. Regardless, it may be wise to require atwo-thirds majority. Another consequence of Brexit is that even though some believe that the EU should continue as it is and potentially get more involved in member states’ economies, the Union’s progress is undoubtedly slowing down. Some advocate a “multi-speed” approach to the EU in which new members are incorporated at a fast pace and older members can reevaluate their stance. In a September 2017 interview with Financial Times, President Andrzej Duda of Poland warned that a multi-speed bloc would undermine the fundamental idea of the EU as a “union of equals” and ultimately lead to the collapse of the union. “If the EU formally becomes a union of different speeds it would in effect be formally divided into better and worse members and it would to a large extent lose its attractiveness for those countries that were deemed second class,” he said. During a debate with the presidents of Georgia and Macedonia at an economic conference in southern Poland, President Duda argued that “thanks to our membership we have become a fully-fledged member of the political union of the west … If now we were going to go back and find ourselves in ‘category B’, for Poles that would mean a reduction in the attractiveness of the EU,” he said. “In addition the EU would become less attractive for those aspiring to join… It would mean one would have to go through many stages to get to the center where some countries stick together and think that they are better.” Macedonian President Gjorge Ivanov echoed Duda’s concerns and said that a two-speed Europe did not make sense “even as a metaphor”, pointing out that it was not possible for a train to move at two speeds simultaneously. 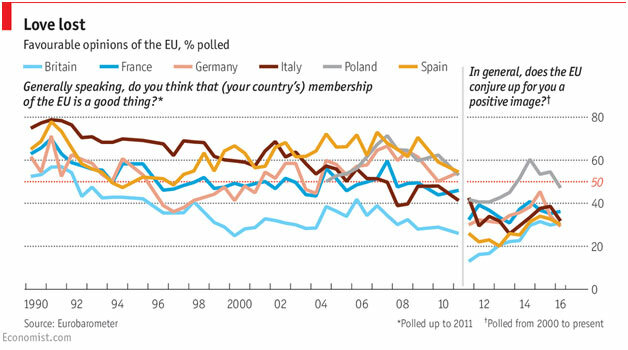 In 5 of the 6 countries polled, public opinion of EU membership has diminished over time. The only country whose opinion has improved is Poland, which had more to gain from joining the Union than most. In December 2017, The World Economic Forum (“WEF”) published a blog indicating that the same stance guides investors and analysts today, regarding the European Union’s future: “investors have recognized that Europe is doing well, they are putting their money where their mouth is -and they want to know what’s next for the Euro area”. Management of immigration and borders: “Europe’s next generation aspires to convert migration into the foundation of a strong society where migrants and their integration are regarded as drivers of economic prosperity and a flourishing and dynamic cultural lifestyle”. 1) Complete the Banking Union by supporting the Single Resolution Fund (SRF) –this is a fund designed to reinin problematic banking practices. 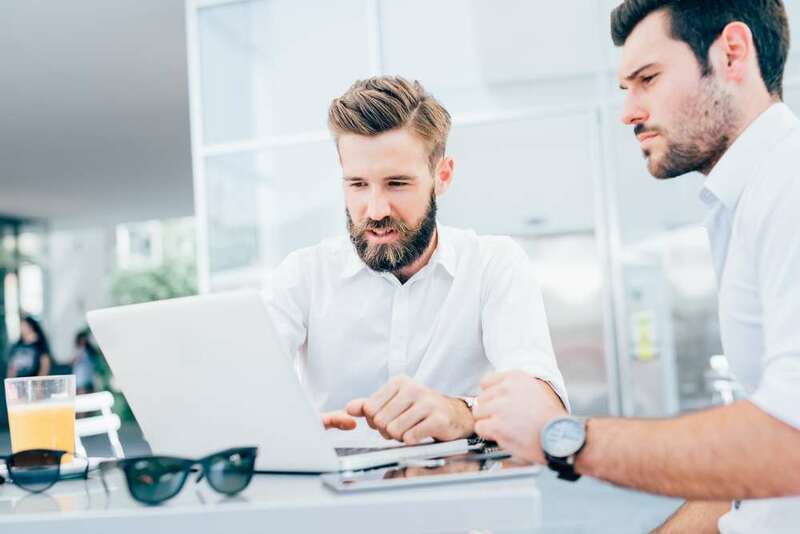 Having a fund like the European Stability Mechanism backing it would prepare the fund for any eventuality, thus enhancing confidence in the markets as a whole. 2) Establish common deposit insurance for the Banking Union: There are currently 19 different potential plans to protect depositors. If the EU can come up with just one comprehensive scheme, it will be a great leap. 4) A limited fiscal facility: a stabilizing fund or entity that will absorb potential future economic emergencies, funded gradually through member states. This doesn’t mean more centralization –a higher concentration of resources could be achieved by re-routing some of the EU’s existing funding. 5) Establish a European Monetary Fund: the International Monetary Fund (IMF)has recently scaled back its involvement in Europe. It also has its own conditions attached to each accord (recent examples include Portugal, Greece and Spain) which often don’t coincide with the interests of the EU, its methods or even its long-term vision. As a result, the EU needs its own monetary fund to fill the void left by the IMF. The European Union’s future is complex and subject to numerous factors. Worldwide, experts and politicians are heatedly debating the possibilities, as the eventual outcome will affect the entire world, not just EU member states. The European Union’s current leadership role will probably only increase in relevance and depth, largely because its attempt to lead by example is somehow lost on other nations, thus creating a trust or moral discrepancy. While other nations are entrenching themselves in endless debates about minutia, Europe is regaining its role as the torch bearer of individual rights, humanism and careful planning for the future. However imperfect, however limited the EU’s future will be, leaders cannot simply wait to see what the it will hold without getting involved. Europe is doing just that, and the rest of the world should follow suit.